StairMaster® offers the ClubStrideTM 5100 elliptical trainer featuring a patented stride technology that creates one of the most comfortable, natural slide motions of any elliptical trainer available. The ROCTM (Remote Operation Controls) allows users to start workouts and control resistance with their fingertips on the upper-body handles. Both upper-body and front handrails enable either a combined upper- and lower-body workout or just a lower-body workout. Both handles have contact heart-rate monitors with digital signal processing. ClubStrideTM ellipticals have patented, articulated foot pedals that track the natural movement of the foot throughout the range of motion. New from Linray, the Score Flex-Tiles Aerobic Flooring is an interlocking resin with an attractive wood pattern insert. It offers the beauty of a wood suspended floor without the high cost and potential for moisture damage. The system consists of tiles that snap together over a rubber underlayment. Both can be installed by the do-it-yourselfer. 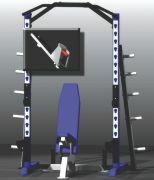 The Varsity Rack Combo athletic training system combines safety with service. The 8-foot-high, 48-inch-deep, 72-inch-wide walk-through unit has laser-cut safety catches and pin-locked catches and provides safe plate storage and bar storage. It includes a four-way chin bar and stainless front plates. Optional features include wood platforms with your logo, technique trays, dip handles, tilt-out spotter stands and 9-foot height. Custom-color powder-coat finishes are also available. Trixter Developments, Ltd. of Stroud, England, now offers its new Trixter X-BikeTM indoor performance bike and the X-BikingTM indoor cycling program to gyms worldwide. The X-BikeTM is an indoor cycling trainer that has a mountain-bike-style handlebar and incorporates a dynamic upper- and lower-body workout. 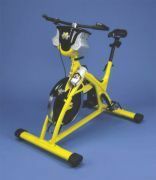 Conceived by Trixter PLC CEO Michael Rice, it takes the monotony out of indoor cycling. The essence of X-BikingTM is the three Fs: fitter, funner and faster. On the X-BikeTM , users stand up, pump the bar and pedals, rock the bar back and forth, stomp over rises, twist through singletrack, and recover on descents. The new Executive Trainer provides users with animated graphics of roads and tracks, while stunning visual landmarks measure their climb to new heights of fitness. 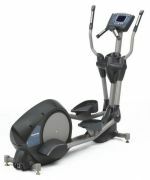 The new Cardio Trainer has a Liquid Crystal Display that provides various data at a glance. Both models now have numeric keypads featuring Quick Speed and Quick Grade to get exercisers right into the workout. An AccuTrack contact heart rate is optional. The Pro Sport Trainer has new, improved graphics and larger buttons for greater ease of use. The L7 Series has a larger 58-inch running surface. All commercial mills come with a five-year warranty. The GravitySystemTM from efi Sports Medicine combines comprehensive four-way programming with GTS, an all-in-one functional, resistance-training machine. The programming can be set for group strength training, Pilates, personal training and post-rehabilitation. The system delivers quick, efficient and effective workouts while maximizing floor space, expanding program variety and increasing revenue. The GTS, a gravity-training device that uses an individual's body weight as resistance, works with a cable and pulley system and free-motion glideboard. 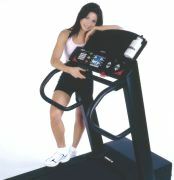 Adjustable to nine different levels of resistance, it's effective for both novice and advanced exercisers. Programming, manuals and two days of instructor training are available. Century offers the Wavemaster VTS—Variable Training System—that introduces target training to a group workout environment. Traditionally used by martial artists, target training can improve timing, coordination and fitness. The VTS can accommodate up to four users, while allowing customized target placement for all skill levels. The unit is stabilized by using proven water-filled base technology and comes complete with four targets. Each rapid rebound target has height adjustments from 18 inches to 6 feet and can be rotationally adjusted at 45-degree intervals to provide for a variety of strikes and kicks. Additional targets are sold separately. The Thera-Band® division of The Hygenic Corporation has redesigned its Thera-Band Exercise Mat with a new and improved high-density, lightweight, non-PVC material. Its closed-cell construction has a fabric-like surface that is waterproof, wear-resistant and designed for repetitive use in fitness and therapy environments. The mats can be cleaned with soap and water. Each mat has pre-drilled hanging holes and comes with elastic straps for easy storage options. Nine different mats are available and come in three sizes, each available in red, blue or green.